The crowd-funding campaign for a new church in Berlin has just begun. 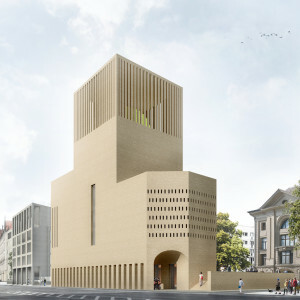 After an international architecture competition, Wilfried Kuehn’s design was selected – one that incorporates space for a church, a mosque, and a synagogue under one roof, along with a fourth space for secular use and dialogue. Called the House of One, it will occupy a space where some of Berlin’s earliest churches have stood, the last of which was destroyed in World War II. The organizers of the project – a Protestant pastor, a Rabbi, and an Imam – foresee it as a place that will promote dialogue, respect, and nonviolence. In speaking of his design, Kuehn stated in an interview for NPR’s “The Takeaway” that, “we participated in this competition exactly because we thought instead of thinking about identity as secluded and isolated, you could think about it in terms of something that has to do with encounter, with relation.” Such sentiments bare a resemblance to the formulation of identity espoused by the late nineteenth-century Swedish artistic community, where the construction of a national identity was a somewhat fluid idea; more inclusive than exclusive. These notions found little traction in the rising tide of nationalisms that culminated in World War I. May the House of One have better success with their optimistic project.